Posted on February 11, 2017 by F.H. This year, I teach Year 7 Digital Technology. For the first 3 weeks of school, there have been no devices for students to use due to updates, new configurations and a broken internet server, meaning that simple tasks such as checking emails have been testing the patience of all the staff! These 3 weeks have given me ample opportunity to explore the type of technology guidelines that the students think are appropriate. It was important to me that these students formulate the guidelines themselves, giving them ownership. Students will be using 1:1 iPads, but also have access to a class set of Macbooks. I gave the students a handout containing 4 examples of technology rules and guidelines from other schools. Their task was to highlight the rules that they thought would be important to use at our school and then use these to write their own set of guidelines. Most students came up with lists that were fairly similar to each other, but we needed a purpose to our guidelines. Enter: our school values. This year, as part of the Positive Behaviour 4 Learning (PB4L) program our school is focusing on: Success, Respect, Integrity & Compassion. As a class, we split the student-formulated ‘rules’ into those 4 values, which led to a great discussion about how most of them covered more than one value. My scribbled columns on the whiteboard weren’t going to make the most attractive poster to refer to, so I spent a few minutes after class putting it together as a Venn Diagram, which I used in the following class. This poster will be displayed in the classroom where we have all of our classes and I have encouraged all other teachers to develop a similar set of guidelines with their Primary School class, or their Digital Technology class. As we all know, technology is used across a myriad of subjects, so the guidelines need to be instilled and agreed upon. How do you come up with technology guidelines or rules at your school? Posted on January 3, 2017 by F.H. I download so many apps onto my iPad and only use a small percentage of them. I don’t download all of them for my personal use – I like to be able to recommend apps for others to use, that they may find helpful or interesting for them or their students. By recommending apps to others, many people in return have given me recommendations of their own. Many of them I have used but not really made the most of it, so I’ve decided to write a list of apps that I want to give a red-hot go in 2017. Not a huge list, but these are apps that I’ve had other teachers tell me about, or found out about through my fantastic Professional Learning Network (PLN) on Twitter. Stay tuned for updates on how I’m using these apps in the school setting…not just the classroom, as my 2017 role is going to be broader than a classroom! What could make QR codes even easier? Posted on August 4, 2016 by F.H. I absolutely LOVE using QR codes in the classroom. There are times when I don’t do a trial run myself and the website or video is blocked or unresponsive, but overall they have saved me so much time and effort. I’ve downloaded some from other sites, but usually just make my own – I’ve found that http://www.qrstuff.com is the easiest website to use: copy link you want, paste into the blank box, click generate and voila! Then it downloads and you either print it directly, or copy and paste into a document. What if I told you that you could make that process even easier? At the recent #EdTechSA conference I went to, I learnt about a new extension for my Google Chrome browser – goo.gl url shortener. To find it, I simply typed the name of it into my browser, followed by ‘Chrome extension’ and it was as simple as that. Once it appears in your browser, you simply click on it when you want to shorten the URL of a website. But, by clicking on the lowest option ‘QR Code’ – it automatically generates a QR code for you! No copying and pasting website details, no opening up a second tab to create a QR, no saving the QR code somewhere in order to download it…it is seriously so quick! If you’re absolutely amazed (like I was)…share it with your friends! Save them all some time! Posted on August 1, 2016 by F.H. This last week I attended 2 seminars at my local TAFE – one on Dyslexia and another about supporting readers through the use of phonics. Both sessions were filled with scary data, thought-provoking questions, numerous definitions and last but not least, lists of apps and websites. B) If it costs, is there a free trial where I can access EVERYTHING? C) Does it suit the technology I have available to me? D) Is it actually going to benefit the student? There are 2 (so far – I’ve barely had time to check any out!) that I rate quite highly. Oxford Owl is a website that provides free eBooks for students, at various age levels and genres. Yes, they have provided audio (with expression!) and the books are actually interesting! I discovered this site through the Spelfabet website, under a list of decodable book resources. ReadTheory is a website that I also heard about at the seminar (from the girl sitting next to me, rather than the presenter!) – free, online, engaging comprehension texts, with questions to match, based on the Lexile Reading Scale. It does refer to Common Core, but Aussie teachers can still benefit! The girl next to me said her students in Year 4 were loving it, as it strikes up a bit of friendly in-class competition while still being matched to each child’s ability. I did a little bit of extra reading about ReadTheory here. Double bonus, both of these resources are iPad-compatible! Yay! I’ve linked QR codes to both of these sites, printed them (along with student log-in details for ReadTheory) and popped them up in the classroom I worked in today. Can’t wait to hear the feedback from the students! Posted on May 24, 2016 by F.H. Tonight with my Year 1 tutoring student, we worked on our Tens Facts. Again. It feels like we are ALWAYS working on our Tens Facts…because they don’t seem to sink in! Ten Pairs – deal out a 4×5 array of playing cards, keep dealing until all cards are gone. Players take turns to pick up 2 cards that add to ten. Concentration – similar to Ten Pairs, but cards are turned over to remember where cards are. Roll to Ten (colour) – roll a die, colour in that many squares on a tens frame using one colour…then count on to get to ten. Colour the squares that you ‘counted on’ using a different colour, then write the equation. Roll to Ten (build) – roll a die, build a tower using blocks that many blocks high of one colour…then count on to get to ten using a different colour block. Write the equation. 10 Frame Fill (app: free) – helpful for creating an interactive visual for ‘How many more to make 10’ and focusing on 10s facts. While all of these ideas were good, there was no urgency to build on the accuracy and fluency of these skills, so she was dawdling her way through our activities. So, today we drew a Tens Rainbow, to use in conjunction with a fabulous app I found, called ‘Make Ten‘. It asks students to choose the number you need to add to the number given to get to 10. My student propped this rainbow up in front of her to use with the app and by the 4th or 5th round, she was actually recalling the facts herself to try and beat her high score and going faster. Technology isn’t always the answer, or the be-all-and-end-all, but if you’re aiming for speed/fluency – this really helped today! I also found this Pinterest board for some more ideas – always looking for more! I would love to hear your ideas for Friends of Ten! Posted on February 15, 2016 by F.H. Today was my first day of relief teaching in the school that I’m not actually working part-time at this year. So, I was not connected to the school wifi, or have log in details or anything. For someone who loves integrating technology into lessons in any way possible, I was slightly ‘meh’ about my day in Year 6. Regardless of this, I had packed my iPad in my handbag. What was I planning to do with it? No idea! But I was determined. I pulled out my folder of ‘Break’ apps, courtesy of @DaleSidebottom. I had ClassBreak, MathBreak, TeacherShake, QuizBreak, BrainBrea, ScienceBreak & LiteracyBreak. All of these can be purchased from the iTunes App Store, search: The Ultimate Teachers App Pack. But which ones could be used without an internet connection? LiteracyBreak – a great range of Introduction Games, Nursery Rhymes, Brainteasers, Debating Topics, Writing Games, Bus Activities (think: school camp and long excursions! ), Group Games and a section for ideas on Organising Groups. ScienceBreak – all sections except Science Videos (links to Youtube videos) will work offline. Great ideas for lesson starters, simple low-prep experiments, fun facts…and the list goes on! ClassBreak – a plethora of activities and games: icebreakers, PE, team building and time filler! Subject games & classroom activities, riddles, jokes, quotes of the day, brain gym & a true and false guessing game. MathBreak – this was my go-to app for the day and my favourite section was the riddles! Most of them were maths-related, but some were just good old fashioned logic thinking! This app also features a list of dice games and times table tricks. Anything else? Well, I asked another teacher if there was a CRT log-in for the Interactive Whiteboard & classroom computer, and there was. (Always pays to ask!) Right – logged in and ready to go! So, at the beginning of lunch, I whipped up a Kahoot survey (it took all of 4 minutes) and once the students had done the required work of writing the questions down, they decided on their answers – survey style. It was a great way of gaining a whole class snapshot of their beliefs & opinions and provided a healthy discussion board for us to chat about. Aaaaand, just because I love inspiring students with clips from Youtube, this clip tied in really well with the topic of our afternoon lesson – serving others. So never fear, relief teachers can use technology successfully! Anything else to add to my list? Why I suddenly hate SMART goals. Posted on May 13, 2015 by F.H. Why do I hate them? Because I don’t know what I don’t know. It’s hard to set goals when you aren’t really sure what is out there. Speaking to an ex-colleague, but still friend, today on the phone. She told me that her current school have told her that they are ‘not an ICT school’ and they ‘will never be going down that track’. Today as she used iPads in her classroom for her students to complete a short Google form, she was scrutinised, as iPads are ‘only to be used by special needs students’. In the next breath, she tells me that she is planning on attending DigiCon. Of course, she won’t be asking her school to pay for her attendance, or even asking for the day off so she can attend both days. She’s going to call in sick. I mentioned that even though I have attended this wonderful event for the last 2 years, I won’t be attending this year. 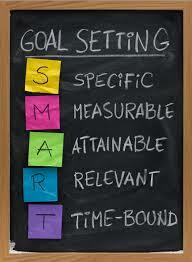 This year, any PD we attend must be clearly linked to our SMART goals, which we formulated in Term 1. I was encouraged to think further that ‘IT’ for my SMART goals, as apparently I already know so much about this area. As we live in a ‘remote’ area (6 hours drive from Melbourne), flying to Melbourne isn’t a budget-friendly option for PD opportunities. Instead, we are trying to bring the PD to our school, so more staff can benefit from a speaker. I understand all of this, but here’s my problem. After attending DigiCon for the last 2 years, I learnt heaps. I learnt about things that I didn’t know existed. How could I possibly formulate these things into SMART goals if I didn’t even know about them? Sure, PD opportunities always have a ‘focus’ – but instead of just one speaker talking about one foci, I have the chance to listen to 10-15 different people talk about a myriad of things – some more IT focused than others. I feel that SMART goals aren’t very smart at all. If they are Specific, they narrow the lens for learning – what about all of the associated learning that may happen along the way and take you along a new, more enjoyable tangent? If they are Measurable, it gives it a ‘limit’ and I don’t like having a ‘limit’ imposed on how much I can or cannot learn. If they are Attainable, it doesn’t offer much of a challenge. I understand that goals aren’t meant to be completely out of reach, but it is nice to actually have to try. If they are Relevant, I fear that by the time you actually reach it, it may be out of date – we need to keep up with the latest and move forwards! If they are Time-Bound, it shows that learning must stop at a certain time – what happened to the concept of life-long learning? I’ve still had to write my SMART goals. Heck, even my students have to have ‘goals’ to try and improve upon. But sometimes it’s hard, because we don’t know what we don’t know. Posted on February 22, 2015 by F.H. This year I have been faced with a significant number of difficult students in my class. Let’s face it, no class is a ‘breeze’. There are individual nooks and crannies to every single student, however the Year 2 class I am teaching in 2015 seem to present a myriad of ‘specialities’. Trying to get my Year 2 students to write is challenging. I have a student with Oppositional Defiance Disorder (ODD), who needs physical stimulation, eg a trampoline, massage, yoga, roller-board to shift his ‘writing brain’ into action. Despite his Occupational Therapist providing me with a wide range of suggestions – some days there is no progress made – the ‘Defiance’ part of his diagnoses comes into play, well and truly! Add to this mix a boy who has autism and hates any fine motor activities, a girl who has super low processing speed, a boy who has the attention span of a gnat…it’s really like any regular classroom. I decided to eliminate the editing stage, to try and build that success. I helped edit briefly, but wanted to show the children that publishing work is fun and something to be proud of. We used this template to brainstorm words to describe our lunchbox. I then modelled how to write the words into sentences as a whole group activity. Once the students had written their sentences, it was time to publish. Take a photo of your partner with their lunchbox. Open PicCollage and add the photo of your partner. Add text boxes with your descriptive sentences. There were a few types of students – those who completed all three stages with ease. Others who did the planning, but found the drafting too draining. There were others who planned and drafted, but weren’t overly interested in publishing – they’d prefer to spend their iPad time doing whatever they like, rather than a set task. It was a fabulous activity to include all students. What other strategies/apps do you use to encourage reluctant writers?